Hamburg is experiencing a broad While racism rages through much of Europe, Hamburg is experiencing the opposite: a broad movement for refugee rights combined with a struggle for the right to the city. refugee rights combined with a struggle for the right to the city. In early 2013, roughly 300 West African refugees reached the German city of Hamburg, following a long and perilous journey from Libya. They had first, like countless other refugees traveling from the African coast, crossed the Mediterranean to the Italian island of Lampedusa — the name that the group of 300 subsequently adopted for themselves. The Lampedusa refugees hoped to receive refugee status from the German state. But German authorities, deferring to EU guidelines, refused to provide them with any sort of accommodations, instead attempting to expel them from the city. As refugees, of course, they had nowhere else to go. So they decided to organize a solidarity campaign to counter the intimidation and bullying of the authorities. This decision was by no means unique – there are many refugee activist groups in Germany, often in coalition with parts of the radical left, engaged in squatting, solidarity activism and practical assistance to refugees coming into the country. What no one could have predicted in Hamburg was the immense, spontaneous wave of sympathy and solidarity their campaign generated. Major cultural and social institutions in the city mobilized behind the refugees. Churches and mosques opened their doors. Squats and left-wing cultural centers made space for the Lampedusa to stay. Eighty refugees were taken in by the St. Pauli Church, next to the famous squatter village in the Hafenstraße and Park Fiction — an independent park (itself the result of a successful campaign against developers and investors) that was renamed Gezi Park Fiction last summer in solidarity with the Turkish protest movement. The park was the site of numerous welcome cookouts organized by Hamburg locals. St. Pauli Church received daily donations of blankets and food to support the refugees. The professional soccer team FC St. Pauli donated beverages and fan apparel and gives the refugees free tickets to every home game. The trade unions ver.di and GEW organized a welcome party in their headquarters and ver.di accepted the refugees as trade union members, giving them the legal protection of the union. 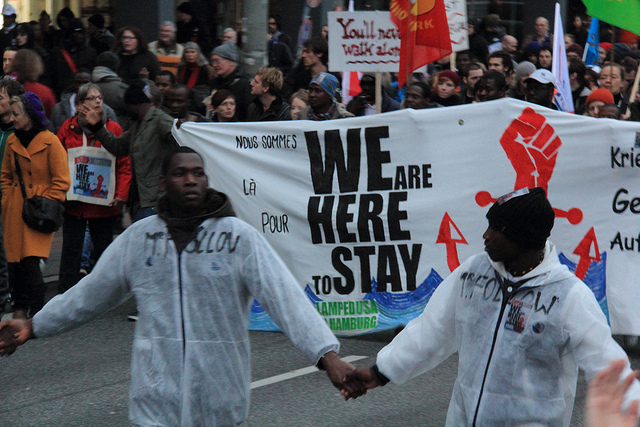 Hamburg was the site of ver.di’s first office for undocumented workers, and the union has a history of expressing solidarity with “illegal” immigrations (though the Hamburg section’s actions have led to controversy with some national union leaders). In one of the campaign’s more unique moments, a well-known local club bouncer spent weeks guarding the church after passersby had harassed the refugees and shouted racist slurs. The refugees returned the solidarity on October 28 by playing an important role in a demonstration against rising rents organized by the local “Right to the City” coalition. Despite the solidarity expressed by left groups, unions, and sections of the general population, the Hamburg city government, led by the Social Democrats, stuck to its story: The refugees’ presence in Hamburg violated European law; therefore, they must go. The movement’s political momentum was accelerated in early October after a ship full of refugees sank near Lampedusa, killing 270. Solidarity from below grew, but no change was signaled from above: on the contrary, Hamburg authorities laid down an ultimatum that all refugees had to register with the police by October 11. On that day, large-scale racist police checks were undertaken with the aim of registering all of the refugees in preparation for their deportation, triggering a wave of protests. Pedestrians were racially profiled and checked if considered to look like refugees. That same evening, over a thousand people took part in a spontaneous, loud, and very angry march through the Altona neighborhood. The next day saw another march; the day after that, yet another. When the movement’s ultimatum expired, they made good on their promise: over a thousand protestors assembled in front of the Rote Flora and marched through Hamburg’s Schanzenviertel without a permit (quite the provocation, given the German state’s preference for polite, orderly political assemblies). The march had barely begun when police attacked. Marchers responded by throwing rocks, bottles and fireworks. Smaller groups of protesters continued to fight with police for hours. The next day, October 16, another 1,100 people marched from the refugees’ protest camp through Hamburg’s central districts. The St. Pauli football fans announced a solidarity demonstration for the following week, October 25, which brought another 10,000 onto the streets after a soccer game, marching to the St. Pauli church. FC St. Pauli has had a radical leftist fan base since the 1980s, when football hooligan culture began to intersect with the many squatting and autonomist movements emerging in Hamburg. In the past, the club has been involved in militant anti-fascist activism as well as anti-racist work and refugee solidarity. The club’s decision to link up with the movement had reached broader dimensions, both quantitatively and qualitatively. On November 2, 15,000 marchers came out to show their support for the refugees; from there, weekly demonstrations began to take place. The protests draw their strength from their deep connections to Hamburg’s Right to the City movement, a broad coalition fighting against the privatization and commercialization of public space and for affordable housing. Hamburg is well-known in Germany for its long history of left-wing urban struggles. In the late 1980s and early 90s, Hamburg’s autonomist scene was able to squat, occupy, and successfully defend rows of apartments in the Hafenstraße, as well as the Rote Flora and others, usually organized as communal apartments and living spaces. The Rote Flora specifically has persisted as an occupied, autonomous community center without any sort of contract or agreement with the city authorities since 1989. It has provided an important logistical and social support network for many left-wing groups and movements since then. Even when squats and occupied centers were defeated by the state, such as the eviction of the counter-cultural trailer park Bambule in 2002, it was never without months of sustained and sometimes highly militant demonstrations that usually dissuaded the city from further evictions. These mobilizations are rooted in the response to what seemed to be an impending wave of gentrification in the city. Beginning in the late 2000s, Hamburg witnessed an explosion in rent prices. Hamburg’s left formed a new Right to the City network to coordinate the resistance. It involves neighbor hood initiatives, artist collectives, and leftist groups, with the organized autonomous group Avanti at its core. Avanti made a strategic decision to build the movements against exploding rents already some years ago, investing many resources into it and offering a durable political structure. This network has been successful in organizing annual demonstrations against so-called Mietenwahnsinn (literally “rent insanity”), with thousands of participants every year. As soon as new investors’ plans for redevelopment of Hamburg’s central districts go public, protests invariably ignite: banners hang from apartment windows, houses are occupied, neighborhood meetings are held. At the moment, Hamburg’s activists are fighting to keep the Esso-Häuser, a pair of late-1950s modernist high-rises well-loved by the local population, from being demolished by their new owners. In a situation that will sound familiar to activists from other major urban centers, the protests have been unable to stop most of the redevelopment plans or prevent the rising rents, but they have been able to raise the political pressure significantly, such that all of the major political parties were obligated to make rising rents a central element of their electoral campaigns and promise extensive construction of new apartments in 2011. Beyond this, activists have also achieved some small victories, like in 2009 when large groups of artists occupied the Gängeviertel, two small alleys in Hamburg’s downtown listed on historical registers. Investors had planned to demolish the streets, but the artists’ occupation eventually succeeded. Now the streets exist as a non-commercial, independent living space and cultural center. Towards the end of summer 2013, it was revealed that the Rote Flora‘s time as an autonomous space was running out: the city had already sold the building to an investor years ago, and he had decided to renovate it and turn it into a commercial music venue. Since this information went public, a variety of activist efforts have sought to hinder the center’s renovation. Given the political context in Hamburg at the moment, it should come as no surprise that these activists have associated themselves with and referred to the refugees’ struggle as part of their own. The German radical left has a long tradition of engaging in anti-racist work and identifying with oppressed minorities. Indeed, refugee solidarity movements are not uncommon in Germany, though they usually remain small and somewhat isolated politically. The moral outrage ignited by the Lampedusa deaths reinvigorated the Left, however, and laid the basis for a mass-scale convergence between the movements. At this point, the Hamburg city government has allowed the refugees to erect a series of heated shipping containers on church property for them to survive the winter. However, the actual demand of the refugees — a collective solution to their predicament based upon their right to stay in the city — continues to be ignored. The protest movement is organized primarily by autonomists, the Left Party (Die Linke), and some sections of the trade union movement. The concrete solidarity like food and clothing donations and social events for the refugees has mostly been limited to the historically left-wing districts of the city such as St. Pauli, Altona, and Sternschanze. In other parts of the city, the government’s position is still supported by large majorities, sometimes due to racism among the general population. If the movement is to force the Social Democrats (who control an absolute majority of assembly seats) to retreat from their current position, it will be necessary to not only continue pressuring them but to expand and attract larger groups from Green and Social Democratic milieus — a process already begun at the November 2 demonstration. Since the end of December, the situation has continued to escalate. Supporters and activists around the Rote Flora issued a call for a nationwide demonstration on December 21 with the slogan “Here to Stay: Refugees, Esso-Häuser, Rote Flora — We’re all staying.” Again, over 10,000 supporters turned out to march, with roughly half of them joining the autonomists’ black bloc and thousands more in the much more vibrant Right to the City bloc, consisting of neighborhood organizations and radical left groups like Die Linke. The demonstration didn’t manage to get far when the police stopped them (despite it being a legal, police-sanctioned assembly) and unleashed wave after wave of tear gas, water cannon attacks, and physical violence. The ensuing street battles were more intense than anything Hamburg had seen in years. Preceding the demonstration on the twenty-first, a group of autonomists attacked Hamburg’s most well-known police station, the Davidwache, with rocks. A week later, police claim, another group of fifty launched another attack on the station, injuring one police officer. This supposed attack led to a sharp campaign against “left-wing violence” and the left in general in the German media. Police capitalized on the shift in public opinion to instate what they called a Gefahrengebiet (literally a “danger zone,” though the Kenny Loggins reference seems lost on the German population thus far), covering large swaths of Altona, St. Pauli, and Schanzenviertel. The “danger zone” stipulates that the police have the right to stop anyone in the zone at all times regardless of motive, demand to see their identification, and ban them from the area if the police choose to. Though this may sound like just a regular day in New York City, these kinds of police actions are very rare in Germany and pose a particular danger for the Lampedusa refugees who are all technically in the country illegally and, for obvious reasons, do not wish to be registered with authorities. Die Linke, represented with eight seats in the city assembly, protested against the police’s danger zone and attempted to counter the media frenzy against the movement, which in turn led the media to attack the party. Just a few days later in early January, it became clear that the second attack the police had used to justify their state of emergency had been entirely fictional, an invention of the police’s imagination for political purposes. The revelation encouraged spontaneous protests numbering in the hundreds. Small groups of activists played games of cat and mouse with the cops, local residents threw “Reclaim the Street” parties, and organized public pillow fights. After nine days of political conflict, the authorities had no choice but to dissolve the danger zone. Hamburg demonstrates what is possible when the refugees’ movement links with local social struggles such as those against rising rents and privatization, particularly when these movements can grow on the basis of a strong and durable left-wing neighborhood presence like that in Hamburg and a radical left voice in parliament like that of Die Linke. Central to these developments has been Hamburg’s large and healthy left-wing cultural and political milieus with their squats, cultural centers and many activist groups interacting with trade unions, Die Linke, and the left-liberal media. These sorts of coalitions do not form overnight — the Lampedusa incident has, in this case, fed the fires of public outrage and brought together a coalition on the Left like never before. But this did not happen in a vacuum: it is due to the years of cooperation and solidarity built up between these milieus that such an explosion could occur. For those frustrated at the slow pace of political development and low level of mobilization on the radical left, we should be hopeful. There are many other cities, in Europe and elsewhere, with many of the ingredients that led to Hamburg’s explosion. Hamburg shows us that more is possible.